An actual physical wall is not only ridiculous, but totally unnecessary. Such a wall is just part of the trillion dollar “infrastructure” program offered by the god-Trump. It plants an image in the mind that the Hayseed Right finds attractive. A virtual wall is far more practical- satellite surveillance and small patrolling drones could spot groups of humans moving toward the border. Agents could then be dispatched to intercept them and turn them back. It would be far less expensive with less disruption of private property along the border and while helping reduce the number of illegally voting parasites. 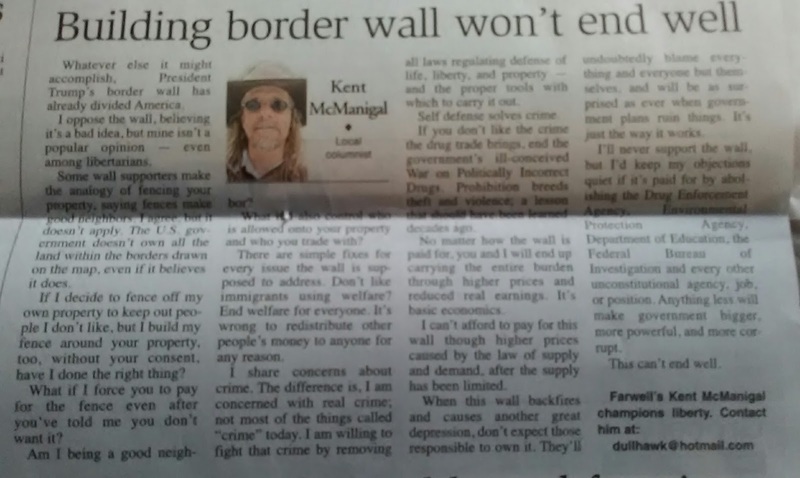 "I oppose the wall, believing it's a bad idea, but mine isn't a popular opinion-- even among libertarians." 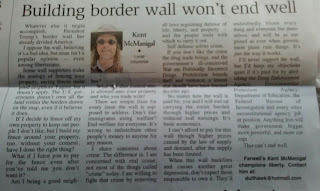 I would argue that anyone who supports the wall is very clearly not a libertarian, but a phony. A government that uses armed thugs and razor wire to control the movement of human beings, none of them charged with any crimes, is a totalitarian tyranny, period. To be sure, there seems to be an endless supply of people who call themselves "libertarian" who are in fact dedicated Statists, but let's not go along with their inaccurate self-label. (I'm not raging at you, Kent, just the phony bozos who mis-label themselves). The thing that gets me are the very good, otherwise consistent people who argue for a wall (or wall-like policies and actions). I can't find any fault in their other positions, and I can sort of see-- if I squint just right-- where they are coming from even, on the issue of the wall. I just can't understand why they can't see how a State big, powerful, and omnipresent enough to "secure the border" is a total State. Unless they simply don't want to see it. In the REALITY of a state controlled world, borders are necessary until abolition and establishment of property lines as a replacement. Otherwise, the ensuing cultural and societal destruction will render such abolition impossible. Parasitic, medieval monkeys have no interest in respecting your property lines or the NAP. Do you really want to have to fight that battle? Do you really want to experience what much of Europe is going through? Just so you can gleefully perch yourself at the top of some mystical, imaginary Mountain Top of Libertarian Purity? "Do you really want to have to fight that battle?" Actually, yes, I would prefer asserting and defending my property lines and defending myself from freelance archators than from a State which does essentially the same thing, but is a larger, more unified gang. I realize not everyone shares my preference, but that, quite honestly, is mine.